I attended Atlanta's Walker Stalker Con 2015 on Halloween Day! That was this city's third annual and their first time at Georgia World Congress Center. The only fandom convention I've ever attended is Dragon Con, so I had a few reference points of what to expect, but there were surprises around every corner! I ran into Stan the Zombie, again! I escaped again, too. Whew! My first chance encounter with Stan the Zombie was a few months ago during Zombie Night at Turner Field. That was a close call, too! I saw a few people and cosplayers I recognized from Dragon Con, but Walker Stalker Con draws an almost wholly different fan base. That's a good thing...that meant a whole new experience! Another bonus, as a relatively new convention in Atlanta the lines were fast and access to the various adventures were quick—except maybe for some of the more popular celebrity autograph opportunities, but I got a few of those, too! These two took Freddy vs. Jason to a whole new level! You know Freddy Kreuger if you've ever seen Wes Craven's A Nightmare on Elm Street and you know Jason Vorhees if you've ever seen Sean S. Cunningham's Friday the 13th. As it turns out, "Freddie" is quite the photographer! She shared with me a few of her photographs and a few shots of a recent wedding she photographed. She has a beautiful style and a delightful personality to boot! I was there on Halloween Day, which of course drew a number of non-zombie folks in costume...so many of them totally awesome! 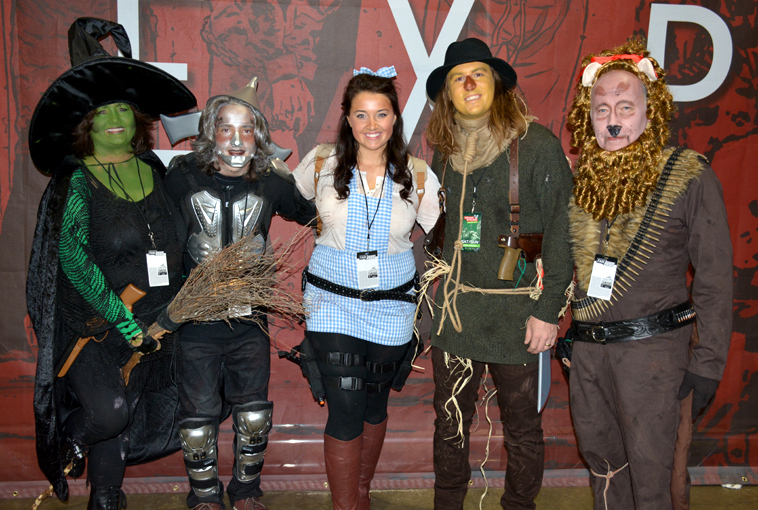 The Wizard of Oz group's costumes were magnificent! And they were super-pleasant...all that skipping, I suppose. That's my friend Carrie on the left (above), one of the founders and owner of Atlanta Movie Tours. They had a booth at the Con and Carrie was back-and-forth between the booth and enjoying the Con. 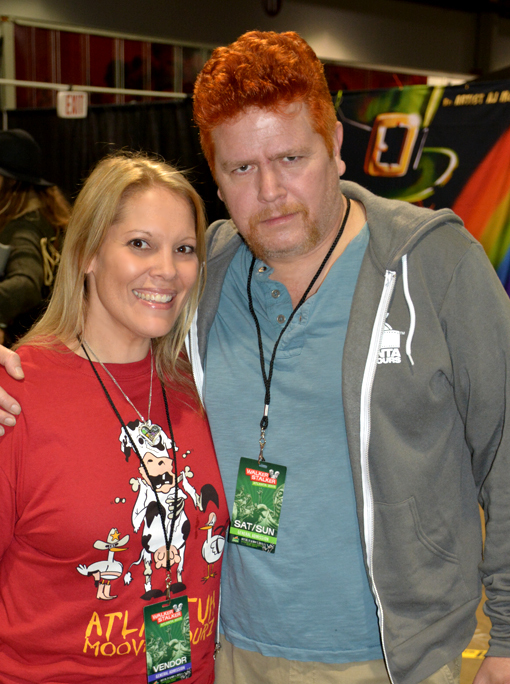 We'd caught up earlier in the day, but later I saw her chatting with Michael Cudlitz, Abraham Ford from The Walking Dead! Being the unobtrusive person I am, I was going to keep on going, but then Carrie motioned to me, "Look who it is!" So, at warp speed I diverted my tracks straight to her and Abraham. It took a second, but then I realized that it was Steven, her husband, not Abraham at all, but damn if he didn't look like Abraham! Excellent cosplay, Steven, excellent cosplay! Speaking of Atlanta Movie Tours, they offer two Big Zombie Tours and they're both fantastic! Check out my posts on Big Zombie Tour 1 (I've done that one twice!) and Big Zombie Tour 2 here on wanderlust ATLANTA. You can check out their other tours here. When I first came across the tattoo aisle, I thought it was more art vendors. THEN I saw that that it was an entire row of tattoo artists, hard at work. 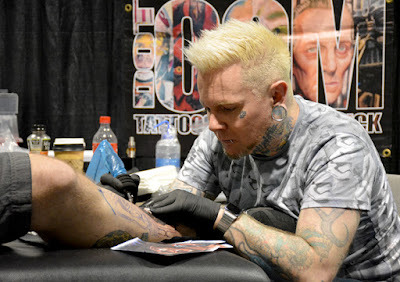 That's tattoo master Chris Jones above—of Chris Jones Tattoos—who has been tattooing for 16 years and has been featured in popular industry media and won a plethora of awards. He's co-owner of his tattoo shop in Cardiff, South Wales. THIS is the tattoo he was working on when I made the above photo (with his permission). He was super-concentrating, so I didn't get to chat with him, but I've since checked out his work and it's brilliant! There was quite a lot going on at Walker Stalker Con 2015! 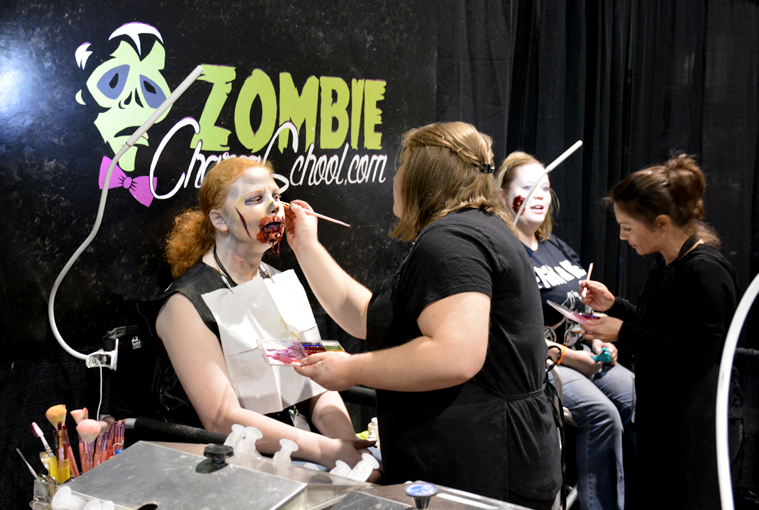 Zombie experiences, interactive gaming, photo ops, merchandise vendors, panels...so much going on! And there were a LOT of celebrity autograph sessions. Being the celebrity spotter I am, and having amassed quite the autograph collection—books and photographs (99.9% of which are from celebrities I've actually met)—I was excited to add to my collection. I got to meet and get an autographed photo from Denise Crosby, who played Tasha Yar on Star Trek: The Next Generation! She was Mary on The Walking Dead and starred in Stephen King's Pet Cemetery, those being why she was at Walker Stalker Con. She's super-sweet...I could not have been more impressed or more happy that she was so incredible! Thank you, Denise, for that wonderful experience! I also got to meet and get an autographed photo from Zach Galligan, from The Gremlins! He was also in an episode of Star Trek: Voyager, my favorite of all the Star Trek series. 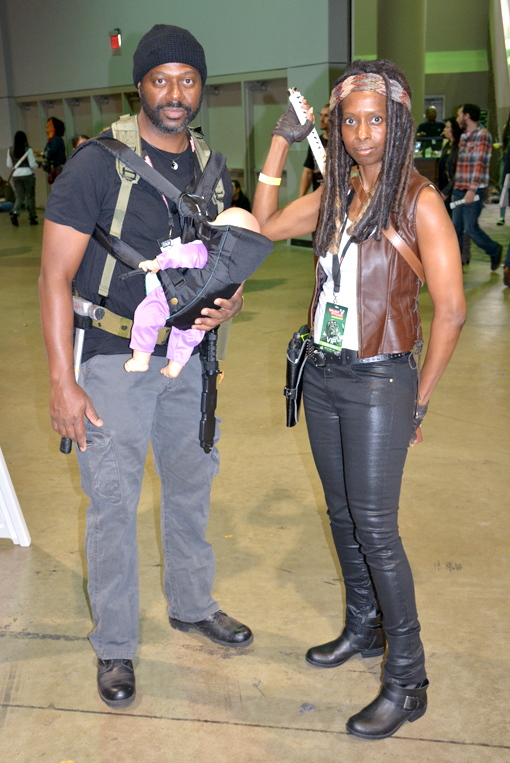 The Tyreese and Michonne cosplayers were fantastic! Baby Judith was a doll, but if you've seen the show, you know that she totally gave credibility to his costume! I was impressed with the number of couples who were cosplaying and who did it so cleverly! You would be impressed at how ingenious some of them were. 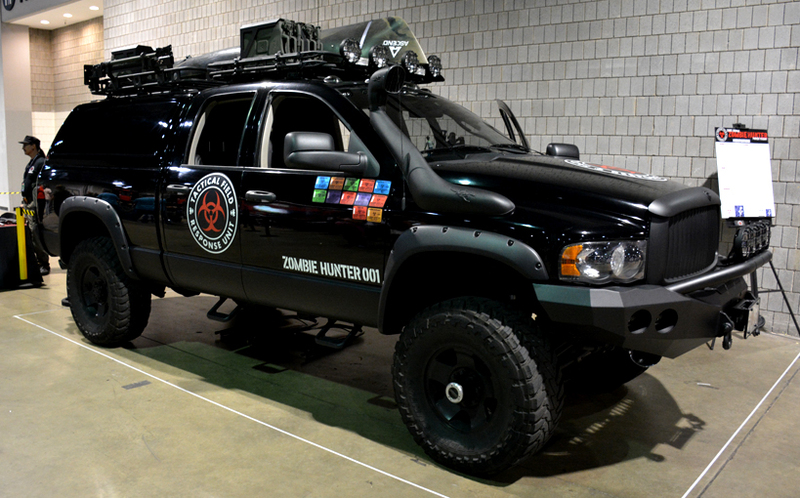 If you arrive at Walker Stalker Con fresh and alive, son't worry. There are vendors onsite who can, pretty much trauma-free, make you undead! Given that it happened over Halloween Weekend, for those who were heading to a party or trick-or-treating, it was a great alternative to at-home, time-consuming, probably more expensive makeup…and they did a great job! Believe it or not, zombies are great family fun. 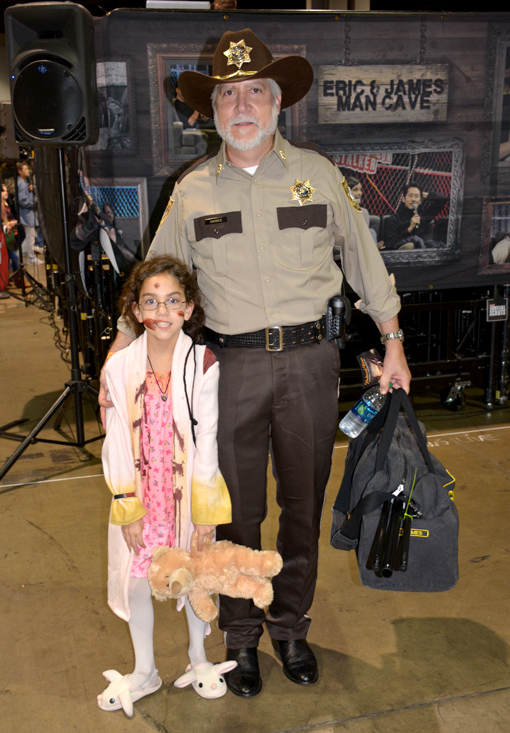 This cosplaying duo featured Rick Grimes and "Zombie Girl" from from The Walking Dead's Season 1, Episode 1. That particular scene, as I recall, set the tone for just how intense the show was going to be, and they’ve not disappointed since! There were a number of kids at the Con and every single one I saw was having a blast! This couple's cosplay was brilliant! 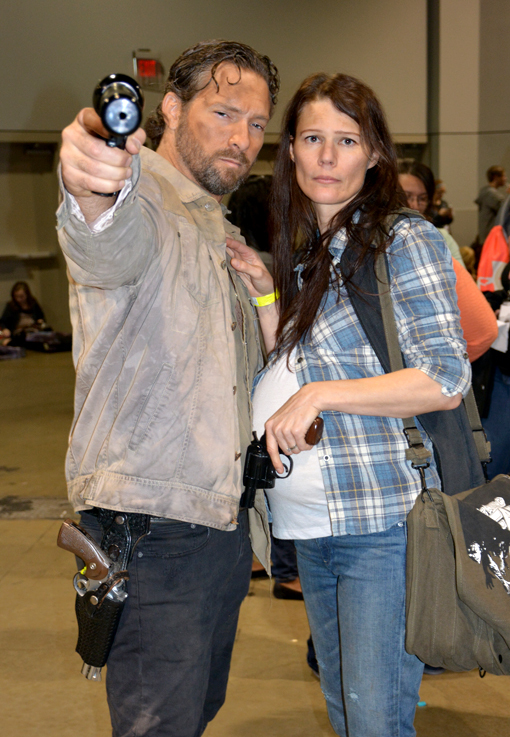 Rick and Lori Grimes, while she was pregnant with the future marathon chocolate pudding eating Carl Grimes. I also had the great pleasure of meeting Jon Bernthal who plays Shane Walsh on The Walking Dead. Super nice guy! Quite the opposite of the jerk that his character was on the show. I love it when a celebrity is personable, approachable and obviously having a good time at a Con. Jon was all of those! 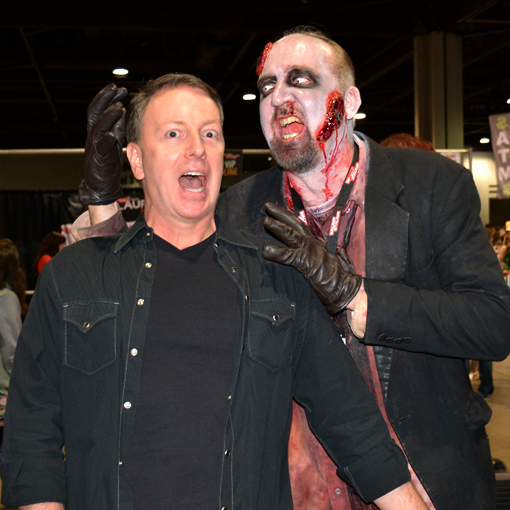 Tickets to Atlanta's Walker Stalker Con 2016 go on sale on November 16, 2015. Dead or alive, be there! Good grief, I had no idea.